On the night of October 1, 2017, a cowardly gunman opened fire on a crowd of concertgoers at the Route 91 Harvest music festival on the Las Vegas Strip, leaving 58 people dead and 546 injured. My wife and daughter were in that crowd and escaped physically unharmed. My daughter had to step over wounded concert goers to escape and there were moments of terror as my wife and daughter were separated for over 10 minutes while the shots rang out. Unable to contact each other, they had no idea if the other had escaped. Fortunately, they both did.One week later my wife and I returned to Las Vegas, feeling blessed and also looking forward to spending the week with brother law enforcement officers from all over the United States and Canada. 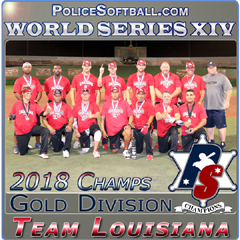 The event we were celebrating was our 13th annual Police Softball World Series at the pristine Big League Dreams complex. Garrett Metal Detectors sponsored our opening ceremony and it was by far the best attended to date as every seat was taken and both right/left field lines were jam packed with onlookers all the way to the foul poles. 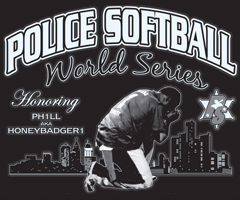 During our opening ceremonies we inducted several players into the Police Softball Hall of Fame, including one civilian. That civilian was event sponsor Brett Helmer of Easton Sports who has supported our event since its inception in 2005. It is rare for a civilian to make the police softball Hall of Fame, but Brett has become an honorary officer and was certainly deserving of his induction. The Dr. Charles Garrett Memorial Home Run Derby featured over 80 hitters but when the dust settled it was East Conference Player of the Year Corey Rogerson who was the last man standing. Rogerson’s reward was a Glock 19 9mm handgun courtesy of Paul Chavez and is the nicest HR derby prize our event has ever offerred. More on Rogerson later in this article. The crowd was then treated to some serious firepower at the hands of Brett Helmer/Easton and Denny Crine/Miken-Worth. In this exhibition the duo hit a combined 18 home runs in 20 swings. Most impressive was the distance of the balls as it seemed every ball either cleared the net or hit it hard in areas unreached by most mortal men. Unfortunately, this division is on the brink of extinction due to lack of participation. We only had 4 teams this year, but those who participated had a blast. They all played three games on Thursday for playoff seeding and then returned on Friday for the single elimination playoffs. It appeared the Sin City Betty’s would finally be dethroned after winning the division several years in a row because the Blue Hit Squad based out of Illinois rolled to an easy 3-0 in round robin play. But Friday was a different story and the Betty’s bounced back to beat the Hit Squad in the championship to win yet another World Championship. This division is rebuilding after reaching a peak of 13 teams in 2011 and dipping to 5 last year, there were 8 teams this year. It appears the two-day format is most popular with the players as most were playing both Masters and Open. It was a straight double elimination blind draw format and the favorites were clearly the West Coast 40’s who have won the previous 3 years. You could sense change was the air because the 40’s were shocked with an early loss at the hands of DJD/Dirty Lawmen (mostly Shamrocks) and sent into the loser bracket. West Coast battled back by defeating Honolulu and the Border Patrol Arsenal to earn a rematch with the DJD/Dirty Lawmen on Friday, but they would need to “double dip” the team that sent them into the loser bracket to begin with. The DJD/Dirty Lawmen were playing like a team possessed and it was clear they would not entertain the idea of an “IF” game. They controlled the game from the beginning and earned their first World Championship by upending the former champs, West Coast 40’s. Thirty-three (33) teams were separated into 11 brackets for round robin/playoff seeding purposes. As expected, the heavily favored Louisville Metro team dominated and earned the top seed for double elimination playoffs. Louisville is such a good team, they were originally scheduled to play in the Majors Division but bumped down after the reformation of Sin City Combo. That was about the only thing that went as predicted because the Gold Division was turned upside with numerous “upsets” being recorded on a regular basis as the playoffs progressed. Speaking of Louisville and upsets, for the first time in history a 32-seed defeated a 1 seed in the first playoff game. The virtually unknown Team Galvez which is based out of Los Angeles looked absolutely overwhelmed in round robin and somehow did a 180 and shocked the circuit by sending Louisville into the loser bracket early. More on Galvez later. The other team that was projected to go far was the NorCal based Degenerates. Once again, the softball gods had other ideas as the Degenerates went 0-2 in round robin. They did manage to bounce back and finish a respectable T-7th, but many felt they would finish inside the top 2-3. Chicago Metro is another big dog in the Gold Division and they delivered as expected. No, they didn’t get a repeat as World Champions, but they were strong in round robin and finished strong at 4th overall. Team Louisiana had an epic run, especially considering they did not participate in the event last year. They were overlooked by many teams, and Louisiana made those teams pay. They finished with their best place ever, 3rd. Remember that 32 seed, Team Galvez I mentioned earlier? Well, those who didn’t know them before certainly know them now. Galvez ran roughshod over their opponents and advanced all the way to the undefeated game. They dropped that game to Lonestar NEP/Texas Cartel, but bounced back to earn a ticket to the dance. Although they fell short, they were the true Cinderella story of the weekend and will certainly be a team to watch next season. Nobody ever doubted Lonestar NEP/Texas Cartel, but few believed they had the horses to win it all. They breezed through the playoffs and clearly looked like the best team on the field all weekend. This team had a history of charging out of the gates and then going cold as they got deep into the playoffs. Not this year. They came out fast like always, but never let off the gas pedal. There was no luck needed this year, they were the best team, and the best team won. For Lonestar it was their first World Championship, but heavy is the head that wears the crown because they have now earned a promotion to the Majors Division in 2018. Nobody would have ever predicted that Louisville would drop down into the Silver Division, but they took their lemons and made lemonade. They went on a tear and started eliminating teams left and right. They advanced to the championship against another team that nobody would have predicted would be in Silver, MO50. It was a well played game by both teams, but Louisville handled business to claim the ship. Last years, Cinderella, the Texas Guns had their chariot turn into a pumpkin. They rebounded to finish a respectable 3rd in Silver, but that is a huge drop from 3rd in Gold the previous year. Meanwhile, Canada’s Regina Cyclones had their best year to date and have steadily improved every year since they started coming to the World Series. 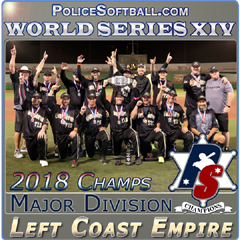 This is the granddaddy of all divisions as it boasts police softballs top tier teams. Many players have USSSA Conference pedigrees and some are household names in the civilian circuit. And based on the caliber of the competition, it was clear this division would be a dogfight. 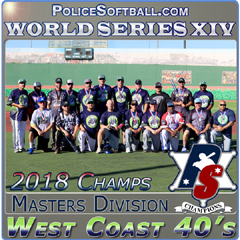 The national #1 seeds included: Battleborn, LAPD Blue, Mid Atlantic, Ohio Lawmen, Great Lakes Lawmen, Pure Sports/3N2, Shamrock Enforcers and the DEA Combo. You can bet that irked some teams who felt they earned the top spot in their round robin bracket, including the consistently good Minnesota Lawmen, the red-hot Missouri Lawmen, and the juggernaut New York Hounds. These guys are veterans so they know the round robin wouldn’t dictate this tournament, but from a pride point of view, nobody wanted to lose a single game. In past years, you knew the SoCal Alliance would either win it, or at least be in the ship. That team did a mic drop last year after their 5th World Championship, which is an incredible feat considering no other team has even won two. Now, the playing fields were even and it was anyone’s game. Every team had the caliber of personnel needed to win the championship, but they still had to perform. Some of the most improved teams were the LAPD Blue (who greatly benefitted with the folding of the Alliance as they had 4-5 former Alliance players), Nassau County (who benefitted from the NYPD Blues folding), the Northern Lawmen (clearly the best cop team in Canada), and West Coast United , who also added some top players. Nothing went haywire in Majors as the two top teams all year, Mid Atlantic and Battleborn worked their way through the winner’s bracket on a collision course with one another. The early season projections had Battleborn defeating Mid Atlantic in the ship, and those projections almost came to fruition. Both teams were playing inspired ball until Battleborn ran into the New York Hounds. 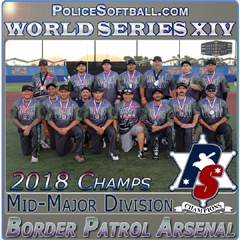 The Hounds executed what could be the finest police softball game I have ever witnessed in their sound defeat of Battleborn. They did everything, and I mean everything right. As the Hounds moved into the undefeated game against Mid Atlantic, I was convinced they were on a mission and would eventually emerge as world champions. Mid Atlantic obviously felt otherwise and they quickly threw the Hounds off by shutting down their offense and wearing out the outfield gaps. Mid Atlantic’s Corey Rogerson was playing softball at a level rarely seen at the World Series and his team was feeding off his energy. Mid Atlantic controlled the game from the onset and never looked back. Mid Atlantic was headed to their first World Series Championship game and would need to be double dipped. Unfortunately for the Hounds, that loss to Mid Atlantic derailed them and they never recovered. The LAPD Blue eliminated their rivals Battleborn and quickly thwarted any comeback attempts by the Hounds. The Blue looked sharp, fresh and young. But once again, Corey Rogerson took the lead, and Mid Atlantic launched a relentless attack on offense that took its toll on the Blue. There was no denying Mid Atlantic as they continued to pour it on, inning after inning. The final count was Mid Atlantic 40 and LAPD Blue 26 in a shootout. Rogerson was named team MVP and in doing so he authored the best season ever by a single player in the history of our sport. Rogerson won East Conference Player of the Year, Dr. Charles Garrett Home Run Derby King, World Series Majors Champion, World Series Majors MVP. The scary thing is, this kid is only 29 years old. The Mid Atlantic legacy has begun. There were some surprise participants in Mid Majors this year, specifically North Florida Showdown and Stanislaus Combo. North Florida was having a banner year and was ranked inside the top 10 on a national level throughout the year. In NorCal, Stanislaus Combo had steadily risen from a solid Gold team to a legit Majors contender. They too were having their finest year and they looked especially sharp in the hotly contested San Antonio tournament. They took the World Champions Mid Atlantic to the final bell before losing by one slim run. Nobody would have ever guessed they would have gone 0-2 in Majors and then 0-1 in Mids. Meanwhile, Nitro2Go from SoCal was supposed to have a banner year and although they started red hot, they lost talent (and games) as the year progressed. Yet, they rebounded strong and pushed the eventual Mid Majors champs Arizona Ablaze to 8 innings. 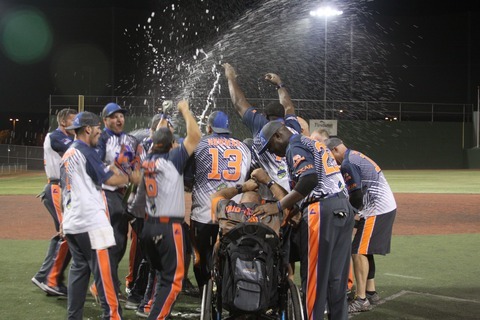 A home run for an out sealed Nitro’s fate and a walk off double by Arizona propelled them to Mid Majors Champions. 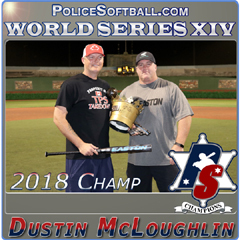 For those of you who don’t know, Policesoftball.com is not a major organization, it is simply me and my buddy Del who started this 13 years ago simply as a way to advertise police softball tournaments. We never envisioned what our website and what this sport (and World Series) has become. This year was another amazing year and we plan on continuing as long as we physically can. The most important people to thank are the participants who spend a lot of money in travel, hotels, vacation time from work etc. to attend our event. They trust that we will deliver a high quality tournament and we do our best to ensure that is exactly what they get. We must also thank our event sponsors, specifically Brett Helmer/Easton and Denny Crine/Miken-Worth who provide the bats for the event and contribute to the prize package. Carlos Vega from Elite Sports is more than just a sponsor as he, on his own donated over $2,000 to our fundraiser for fallen LVMPD Officer Charleston Hartfield who was killed during the Mandalay Bay attack. Overall, we brought in over $10,000 which will go directly to his spouse. Carlos hosted a “last man standing” fundraiser that brought in thousands toward the cause including big donations from Lockdown Sports (Terry Dugan $1000), DynaMac (Dan McIntyre $1,000), Paul Chavez, among many others. Speaking of the fundraiser, so many people contributed to the raffle giveaways and purchased raffle tickets that it would be impossible to give them all credit. It was truly a team effort. Big League Dreams and their amazing staff led by Ed Farmer, TJ Lombardi and Chris Devlin kept the facility running smoother than a Rolex watch and they treated the Las Vegas players to a free dinner in order thank them for their work as first responders to the attack. Of course, Ernie and Nicole Ono from USSSA were amazing running the umpire crew as always and made our jobs as tournament directors very easy. Softball Magazine needs to be mentioned because they have been there by our side since the beginning. Garrett Metal Detectors was a major player in our opening ceremonies and HR Derby. 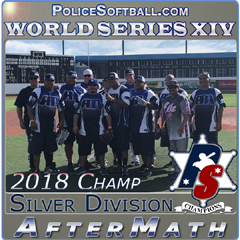 Arpin/Rockwell (Paul Chavez) ensured our Major Division Champs and HR Derby finalist went home with Rockwell Thin Blue Line watches. They have both really stepped up and become an integral part of our sport. This year our HR Derby winning pitcher got into the prize package action as he took home a pitching screen courtesy of Godfather Pitcher Screens. The electric Golden Nugget Hotel continues to do a great job accommodating our guests at reasonable rates. Dennis Leonard and 3N2 Sports have been long time contributors and we even added a new sponsor in SX3 custom gloves who donated custom gloves to the Defensive MVP’s in the 4 men’s open divisions. Although SCDSA president Kevin Mickelson’s plane was delayed he still made it out to the fields and we appreciate the custom plaques he and his organization provide every year. For now, World Series XIII is in the books.